Victoria has been put down since the day she was born. First by her parents who were disappointed that she survived while her twin brother died. Then by her verbally abusive husband and his low-life friends. But soon an intriguing artist named Elliott arrives in town and starts encouraging Victoria to follow her dream of opening her own dance studio. She also begins to receive phone calls from a mysterious someone who gets her to open up about her past and face her true feelings. In No Story to Tell, KJ Steele has captured the small-town atmosphere and brought these characters to life. From the victimized Victoria, to her drunk and obnoxious husband Bobby and his drunk and obnoxious friends, to all the side characters who you'd expect to encounter in a town like this ~ all are so realistic in both their actions and their voices. She has written a compelling story of an abused woman who thinks she is trapped in this loveless, miserable existence. But then she finds a spark of hope to hold onto, at least for a brief time. For most of the novel, I was really engaged and hopeful. At times I felt frustrated with Victoria, but I understand that people who are abused in this way cannot just change overnight. But then toward the end, Steele took Victoria and the story in a different direction that really threw me off. I don't want to give away the ending, but I'll just say that Victoria didn't follow the path I expected her to follow. Some of her actions toward the end of the novel were a bit too much for me. Although perhaps they were just a bit too realistic. Overall, this is a well-written, engaging, mysterious novel that I enjoyed on many levels. This is not a lighthearted read, but I think it would appeal to those who enjoy contemporary fiction that tackles more serious issues and features interesting, realistic characters. 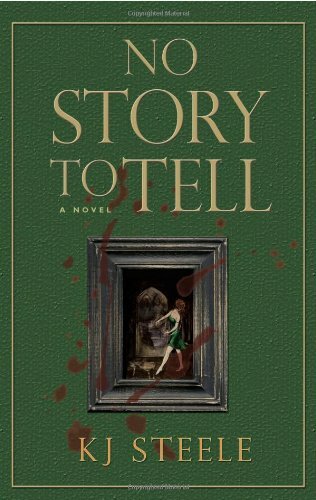 This review was written based on a copy of No Story to Tell that I received from The Fiction Studio in exchange for an honest review.